Ok, I've finally taken the pledge. I'm doing it too & it's been great so far! 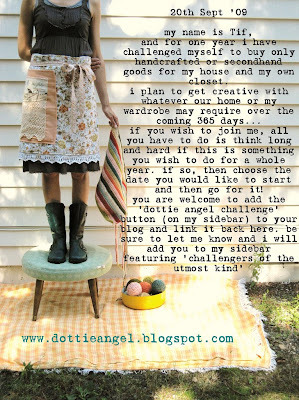 I'm really enjoying everything handmade & thrifting for secondhand is just such a buzz. Yay for you! Eeek! I thought pledging to not buy new clothes for 4 months was hard enough! Good luck! I have taken up Tiff's challenge - though I am only a few weeks into it. So far so good! Just tell me how I deal with gifts for birthdaying teenage boys and I'm in. Although re-reading the pledge - do gifts to tricky nephews count??? I think when I have a little more free time, I would love to do this. So cool that you are signing up! Yay! I've signed up not to buy any clothes that come from a sweat shop at another blog, and I've found that formalising it in my mind has really helped! No impulse buying those little things that I don't really need. This concept looks even more intense and exciting! Good luck! Good luck!! I practically already do this. The only clothing items I've gotten new were a few items months ago, on clearance at Target and $2-3 each. Other than that, it's thrift stores and hand-made for me! interesting, and a great concept. am just thinking about little boys and their new undies and socks. . . that would be tricky. and when i need something clothes wise, i seem to need it straight away! the hunt for 2nd hand can take a while. Yeah I'm sure there will be a few hurdles for me too but I will do my absolute best. Fortunately being a shopaholic in a previous life means I have heaps of clothes in the wardrobe to fall back on. It sounds quite tempting, not sure if I could stick to it 100% Good Luck! Good luck! You are very brave and very wonderful. I'm not there yet but maybe working towards it one day.